TAO Beach 2012 grand opening at The Venetian Las Vegas celebrated the start of the pool season on Saturday. DJ Samantha Ronson provided the soundtrack that kept pool goers partying all afternoon. Joe Jonas hung out in the grand cabana overlooking the pool for a prime view of the party. Gossip Girl’s Jessica Szohr, along with Krysten Ritter, star of the new hit Don’t Trust the B in Apt. 23, and her boyfriend actor Brian Geraghty all celebrated the day in a cabana, enjoying cocktails and signature dishes from the TAO Beach menu. Jessica paid a visit to Joe Jonas and hopped into the DJ booth to say hello to Samantha Ronson. 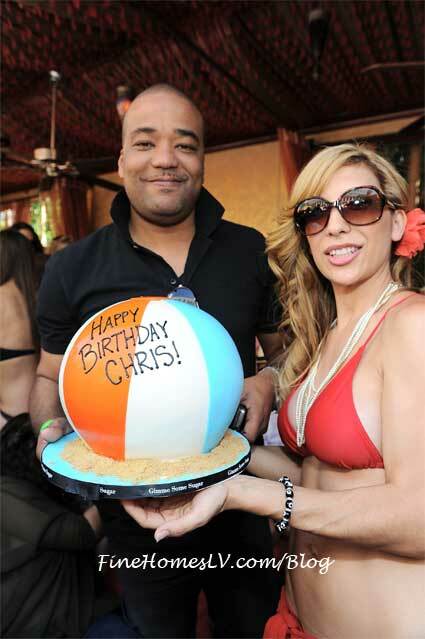 Chris Lighty, head of entertainment conglomerate Violator, celebrated his birthday at the pool season opening, with a beach ball cake and a performance by mariachis in recognition of Cinco de Mayo.